How to Design REST API? Current: How to Design REST API? REpresentational State Transfer, an architectural style that can be used in building networked applications, is becoming increasingly popular nowadays. Many leading vendors have opened the doors of their services to developers, providing them with restful accesses to different web services. 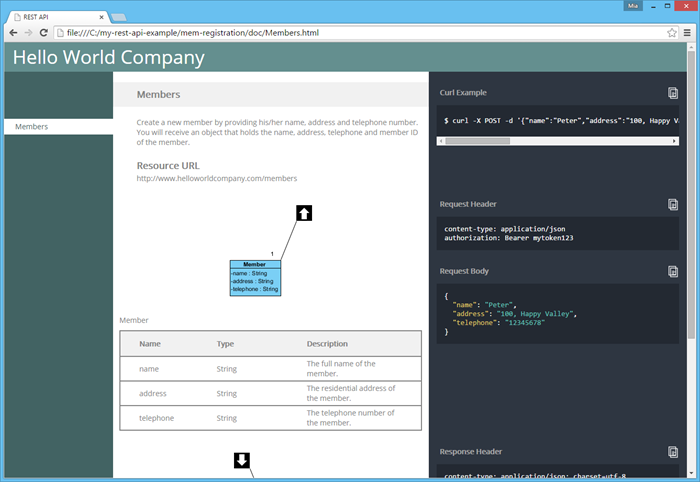 This tutorial shows how to design REST API with Visual Paradigm. The generation of API (code and library) and API documentation will also be covered. In this tutorial, we will use a simple membership registration service as an example to show how to design the REST API for such a service. 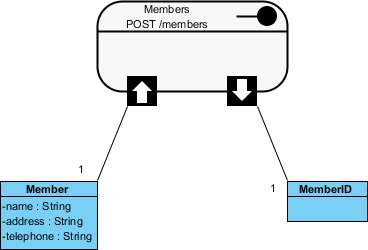 The design of REST API has to done in a Class Diagram. 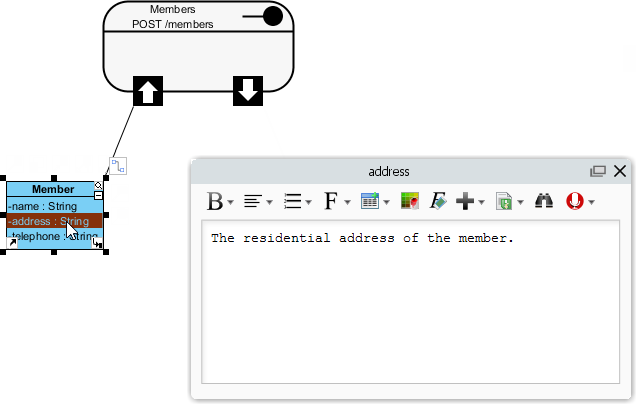 To create a Class Diagram, select Diagram > New from the toolbar. 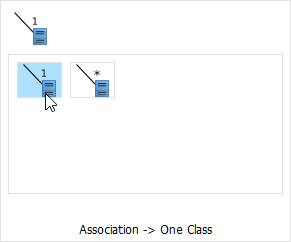 In the New Diagram window, select Class Diagram and click Next. 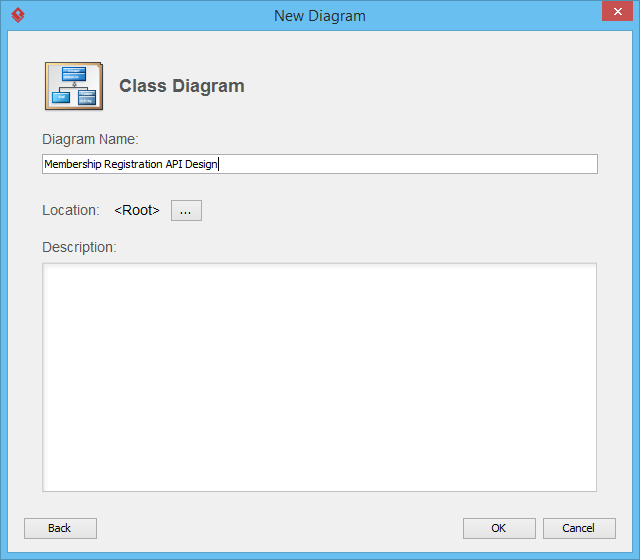 Enter Membership Registration API Design as diagram name. 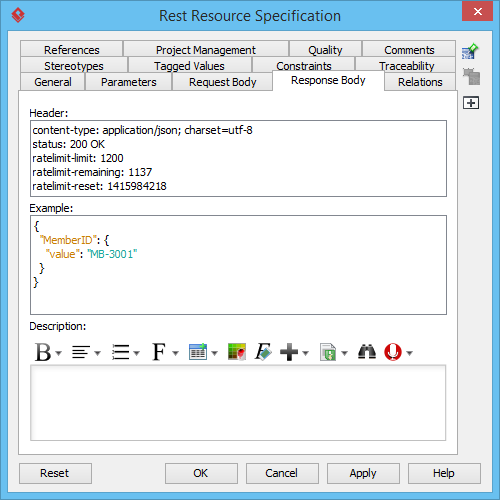 Select REST Resource in the diagram toolbar. 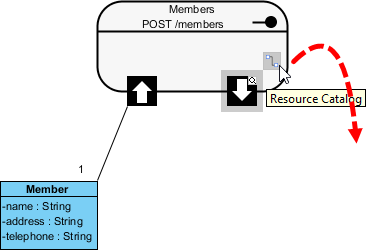 Click on the diagram to create a REST Resource and name it Members. Right click on the Members REST Resource and select Open Specification... from the popup menu. URI /members Each REST Resource has its own URI. Consumers access to URL to access for the REST Resource. Typically, a RESTful URI should refer to a resource that is a thing instead of referring to an action. Therefore, when you are deciding the URI, try to use a noun instead of a verb. Method POST Specifies the action to act on the resource. GET - A GET method (or GET request) is used to retrieve a representation of a resource. It should be used SOLELY for retrieving data and should not alter. PUT - A PUT method (or PUT request) is used to update a resource. For instance, if you know that a blog post resides at http://www.example.com/blogs/123, you can update this specific post by using the PUT method to put a new resource representation of the post. 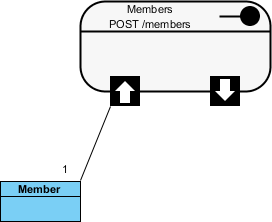 POST - A POST method (or POST request) is used to create a resource. For instance, when you want to add a new blog post but have no idea where to store it, you can use the POST method to post it to a URL and let the server decide the URL. DELETE - A DELETE method (or DELETE request) is used to delete a resource identified by a URI. Description Create a new member by providing his/her name, address and telephone number. You will receive an object that holds the name, address, telephone and member ID of the member. Description of resource that will appear in generated API documentation. It is recommended to provide clear description of the service, so that the consumer know what the service is and how to operate with it. Let's say membership registration requires users to provide information like name, address and telephone. In API level, these are the parameters required by the service and should be provided by the consumer of the service. Let's represent this in our design. Move your mouse pointer over the REST Request Body icon and drag out the Resource Catalog button at top right. 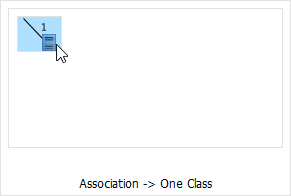 Release the mouse button and select Association -> One Class from Resource Catalog. 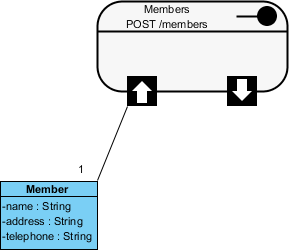 Add three String attributes into the Member class as parameters - name, address and telephone. Enter the description of the three attributes. You can enter the description in the description editor or in the attribute specification window (Right click on an attribute and select Open Specification... from the popup menu). The description entered will be presented in the API documentation. name The full name of the member. address The residential address of the member. telephone The telephone number of the member. That's all for the request part. You are free to create a more complex structure by creating more associated classes, but normally you don't need to do this. Now, let's move on to the response part. Value(s) to be returned by server, if any, is modeled via the Response Body. Let's say a member ID will be returned by the server upon the creation of membership. 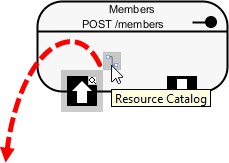 Move your mouse pointer over the REST Response Body icon and drag out the Resource Catalog button at top right. Note: If the service will return an array of objects, select Association -> Many Class instead. Add a String attribute value. Enter the description of the value attribute: The member ID. A HTTP message consists of a HTTP request line, a collection of header fields and an optional body. 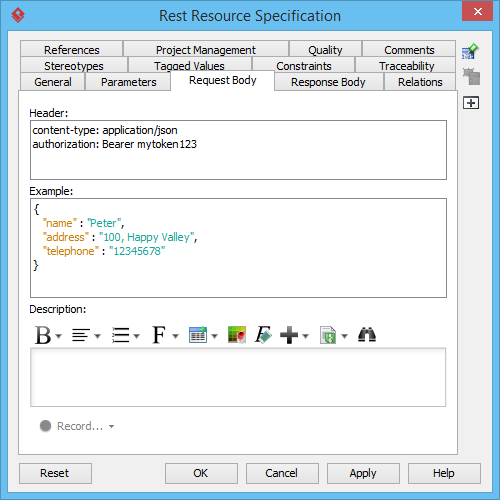 In order for consumers to access a REST Resource, you have to specify the request headers and request (body) example. The request header and example specified will be presented in the generated API documentation. Consumer can then follow the documentation in using the API. Open the Request Body tab. Open the Response Body tab. Once you have finished the design of your REST APIs, you can generate the API and the API documentation. Select Tools > Code > Generate REST API... from the toolbar. In the REST API window, keep Provider selected for API Type. By doing so, you will be able to generate API documentation as well as the server sample code that guides you in programming your service (logic). Check the Members resource to generate API. Check Generate API Documentation to generate the HTML files that shows how to use the selected REST Resource(s). Supposedly, you will publish the generated API documentation in your website, so that the consumers of your service can read through it to know how to access use your APIs. Enter your company name, which will be presented in the API documentation. Enter the base URL of your services. Check Generate Sample to generate the source code that teaches you how to program your API. The sample code is rich and informative. Therefore, instead of programming from scratch, we strongly recommend you to generate the sample code and modify its content to fit your needs. Enter the output path of the code. Click Generate. The following folders are generated in the output directory. doc The API documentation. You should publish the API documentation in your website, so that the consumers of your service can check the documentation to learn the API. and then place the file in the lib folder. sample_src The sample code of client and servlet. It shows you how to access as client and how to react to a request as provider. We strongly recommend you to copy the code and modify it by filling in your own service logic. src The source code of the communication model. Do not modify the file content or else the code may not be able to function properly. Open the generated API documentation and take a look. The design (image), description of parameters, request and response header and example are presented in the document.